---It was a cold and frosty day for the second gathering, but the spirits were warm. 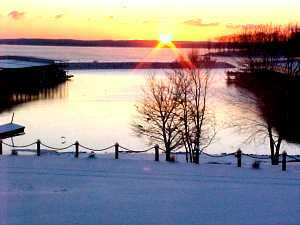 -----JJanuary is a cold month for a C-Dory Gathering in Kentucky. We decided not to meet on the water. 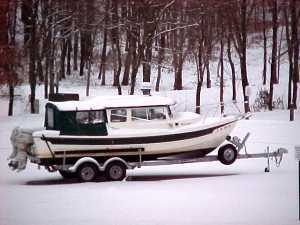 We would not only have to crack the ice on Lake Barkley but the boats were in three different places and we didn't feature towing on snow. -----J We gathered at a local restaurant and had a fine time swapping tales and future plans. Marge and Tom were our local hosts and gave us a great tour of historic downtown Paducah. 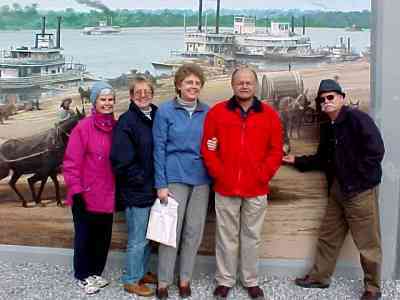 The picture above is taken in front of the 'sea wall' that protects the town from Ohio River floods. The wall is festooned with murals depicting the history of the town. -----It can be mighty chilly in Kentucky in January, but the good companionship kept us warm.